I’ll probably finish all of it up tonight or tomorrow. Then the only thing that remains is the signature strip. I’m plotting that out right now. Post-project separation sadness has already set in. You can see that I’m filling in the area to the left of the dragon. I’ve finished the first dark band, and am now on a lighter one just above it. Two more to go, balancing the progression of shade values on the dragon’s right. Then it’s a sliver of the voided leaf panel at the top of the work, to finish that off even with the edge of the strips below. And finally – I will sign the piece in the strip beneath the dark panel on the leftmost edge. And it will be done. Maybe two more weeks? More if work deadlines intrude. The sharp-eyed will note that the voided one on the bottom is included in TNCM, on Plate 28:4. It’s from Jean Troveon’s Patrons de diuerse manieres…, published in Lyon in 1533. Those of long memory may remember that I’ve used it before. 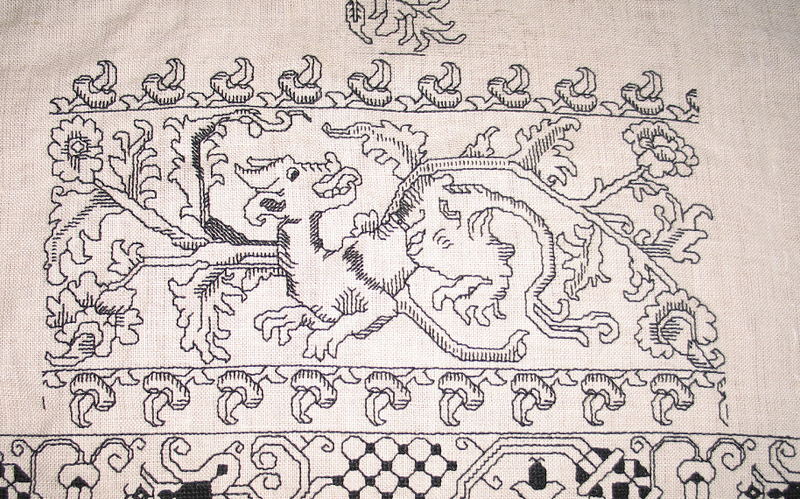 It’s doubled, and appears on the left and right-most edges of my filet crochet dragon window curtain. The lighter strip I’m currently working on will be in TNCM2. It’s adapted from a non-graphed (but oh-so-obviously-intended-to-be) design in Ostaus’ La Vera Perfezione del Disegno…, Venice, 1561 and 1567. I’ve chosen to augment it here with the frilly edge treatment. In any case, the holidays have departed here at String. The tree is undecorated, the cookies, panforte, goose, cassoulet, and other goodies have been consumed or distributed. And the long slog through the year commences. Just the upper left. You can see I’m finishing out the leaf strip that runs across the entire top. Then I’ll find several smaller strip patterns for the area beneath it. I’ll use two relatively narrow dark strips to set off the space, similar to what I did on the right, then fill in with lighter ones. But they will be different from the set on the right. I used five total there. I might use six on the left. It will depend on what strikes my fancy when I get there. After that the only thing that will remain will be signing the piece in the small blank area immediately beneath the mega-dark strip on the left hand center edge. In other news, there are major seasonal celebrations afoot. First is a happy birthday to Long Time Needlework Pal Kathryn Goodwyn -she of “Too many centuries, too little time.” Long may she research and stitch! And I tease readers here again about her forthcoming Flowers of the Needle series, which I’ve had the opportunity to see in preview. It’s worth every bit of slavering, panting anticipation. Plus it’s Cookie Season again in String Central’s kitchens. That means the obligate ten varieties, plus Panforte again this year. 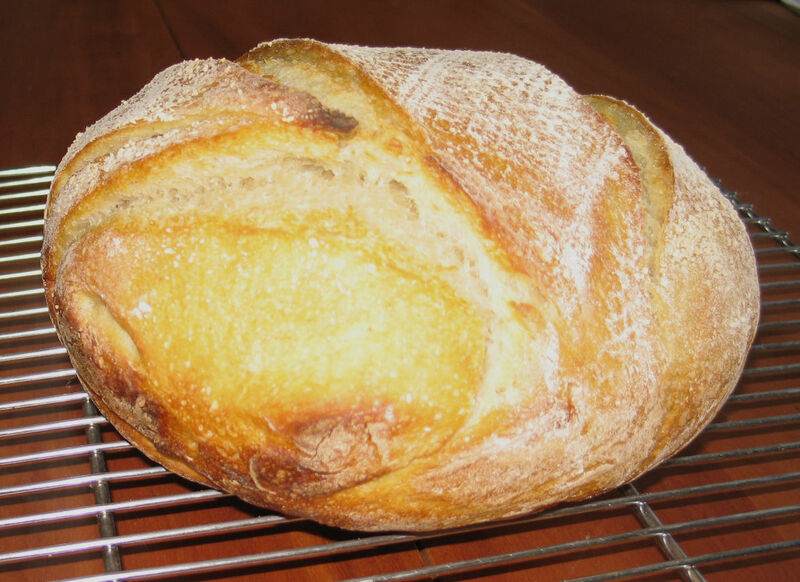 I delight in having an apprentice baker now, and no longer having to staff the entire manufactory myself. UPDATE: THE UNICORN PATTERN BELOW IS NOW AVAILABLE AS AN EASY DOWNLOAD PDF AT THE EMBROIDERY PATTERNS LINK, ABOVE. Holiday over, we slowly revert to standard routine here at String Central. However, that doesn’t mean we have nothing to show off. 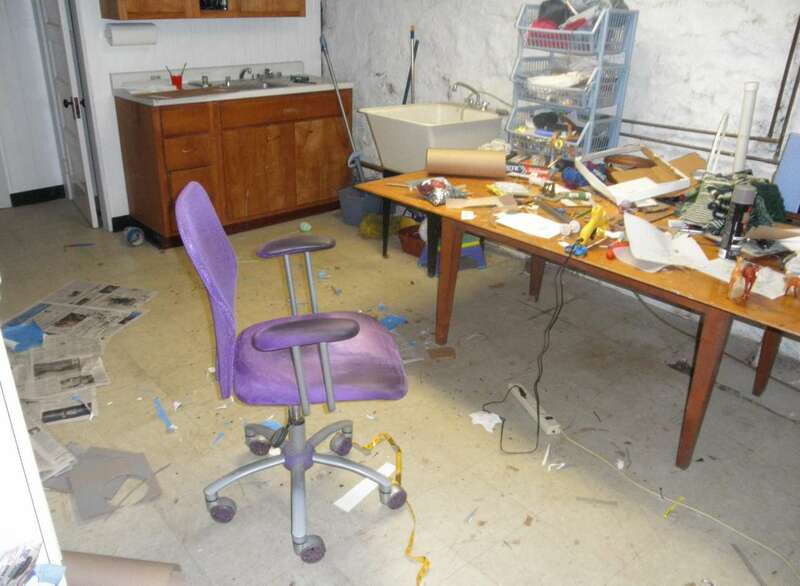 Too bad the teachers don’t grade them on general post-project carnage. Apple. Tree. Lack of distance between the two is noted. With considerable pride, I might add. The dark band with the frilly edging will be in TNCM2. The one just below it was in my first 1974 booklet. I recently rediscovered that I had graphed it from my all time favorite source. 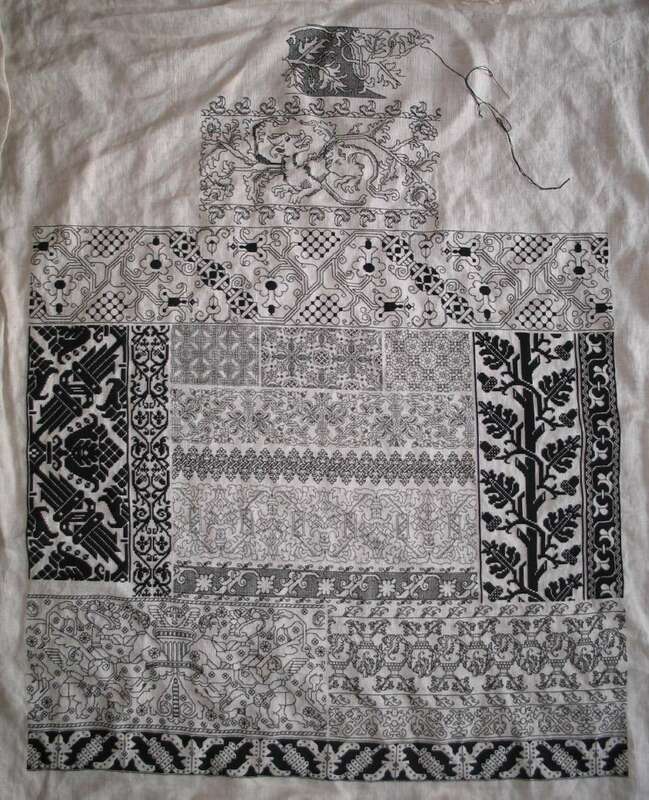 It’s the pattern I used for my double sided double running stitch logic lesson back in August, 2010. You can find the lesson (and the pattern) here. 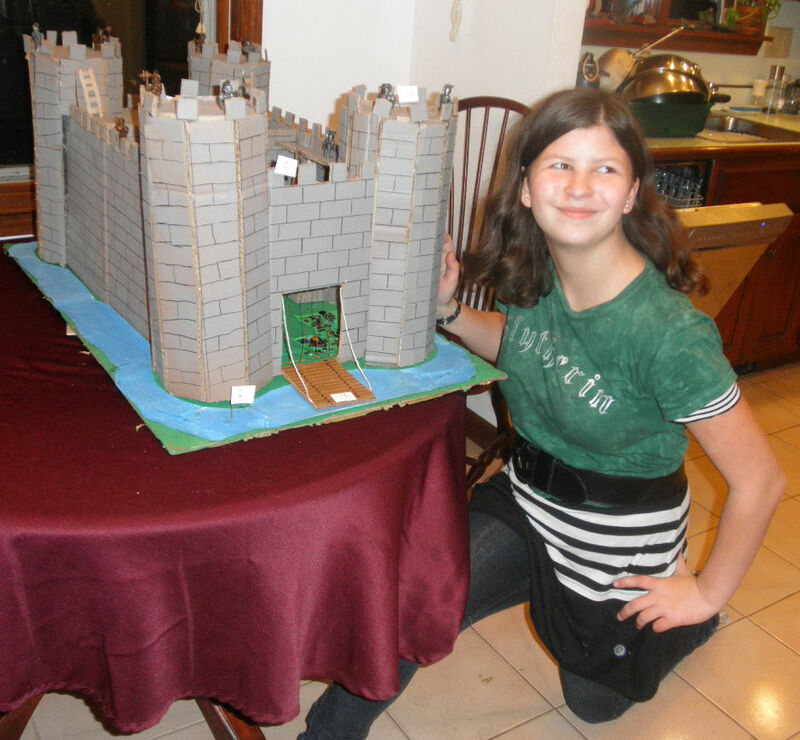 YOU GUESSED IT – MORE PROGRESS! Three bands, about 60% of the height of the area filled. These patterns are all in TNCM2. 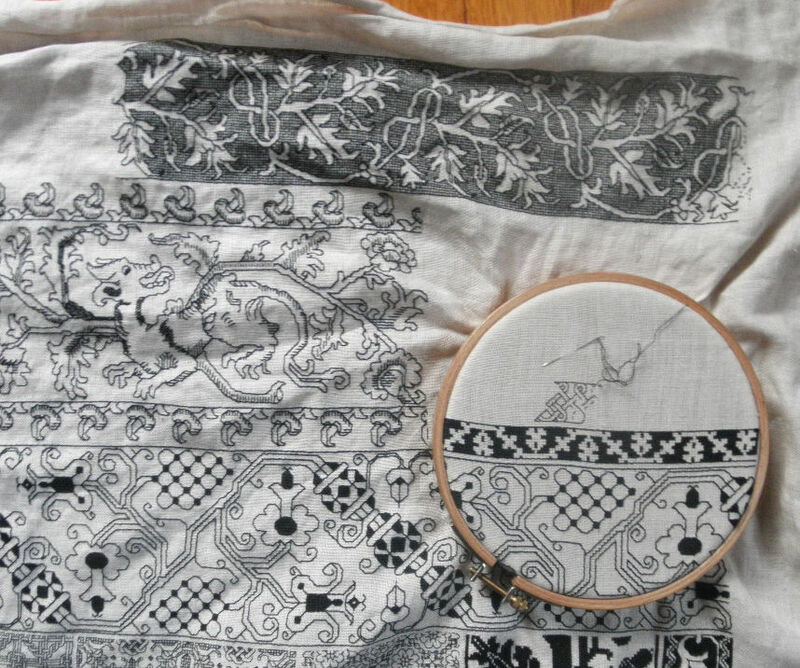 And speaking of upcoming books – I’ve been busy lending a hand to Long Time Needlework Pal Kathryn, helping her over some minor layout hassles as she readies her greatly spiffed up and recomposed Flowers of the Needle re-issue. I can’t break official silence to say when and where, but I can assure you that it’s going to be well worth the wait; and that I’ll be sure to post links to Kathryn’s site when it goes live. In the mean time, off to bake pies and sterilize the house in preparation for the holiday. Punto a spina pesce – obviously Italian in provenance. Hard to tell from the photos (and not being able to see the back), but the angle of the long-leap over may be greater than in tent stitch, but this may be an artifact of differences in warp/woof thread count of the ground. Or it may be possible that the reverse shows horizontals instead of LACS’s verticals. It’s interesting to note that the Museum of Fine Arts, Boston distinguishes between tent and punto a spina pesce. 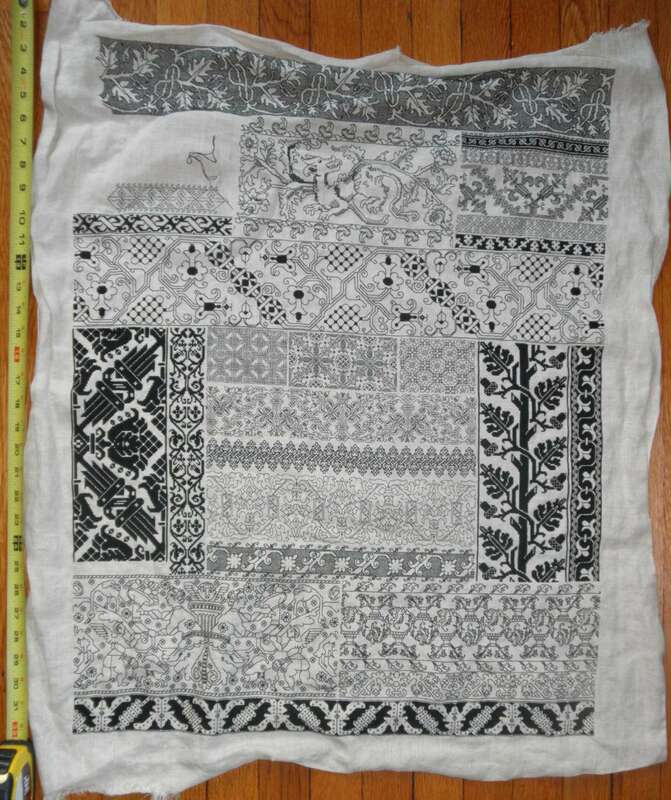 The photos do show however that stitching direction for this one seems to vary on the whim of the stitcher, combining horizontal, vertical, AND diagonals. Closed herringbone – also seems to closely resemble LACS on the front, but produces horizontals on the back. LACS forms a species cline (a related continuum) with the herringbone family. 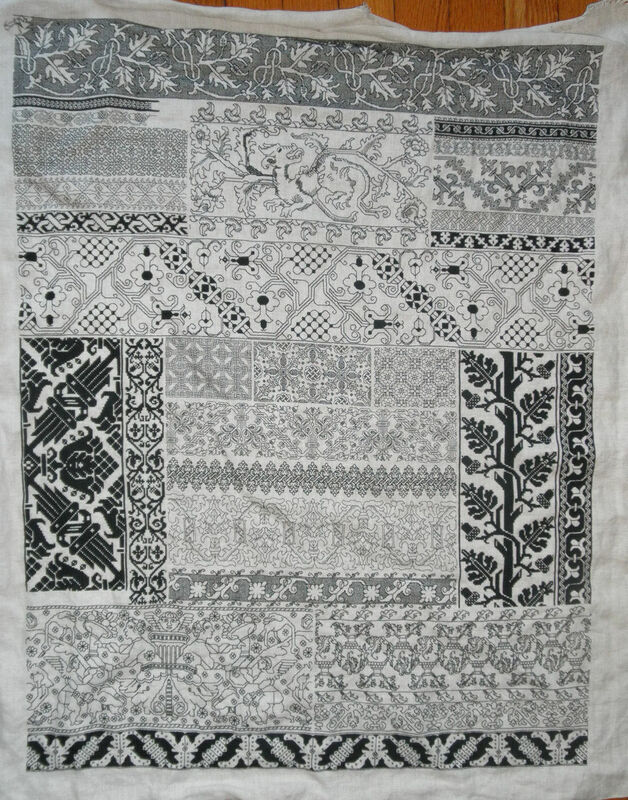 Portuguese Stitch, twist stitch, Slav stitch, twist stitch, long-legged cross stitch, plait stitch Greek stitch – all reported names for LACS. Some can be found here. 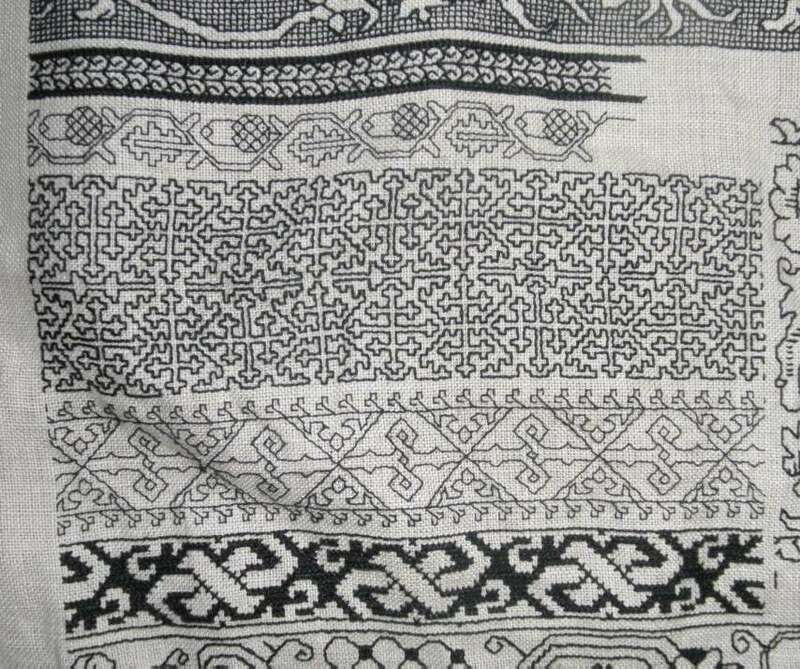 Montenegrin Stitch – A related stitch, but with an additional vertical component. 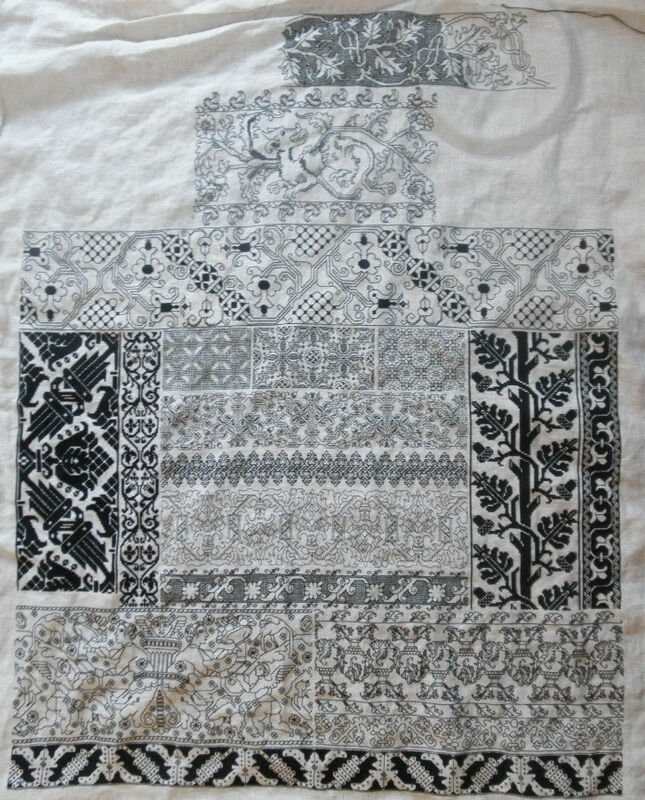 The stitch is used more for foreground stitching, rather than background fill, and the direction of stitching closely follows the design’s lines – merging horizontal to diagonal, to vertical as dictated by the pattern being stitched. (It’s hard to tell but the fifth band down on this sampler, with the strong blue up and down may be Montenegrin, or may be LACS). 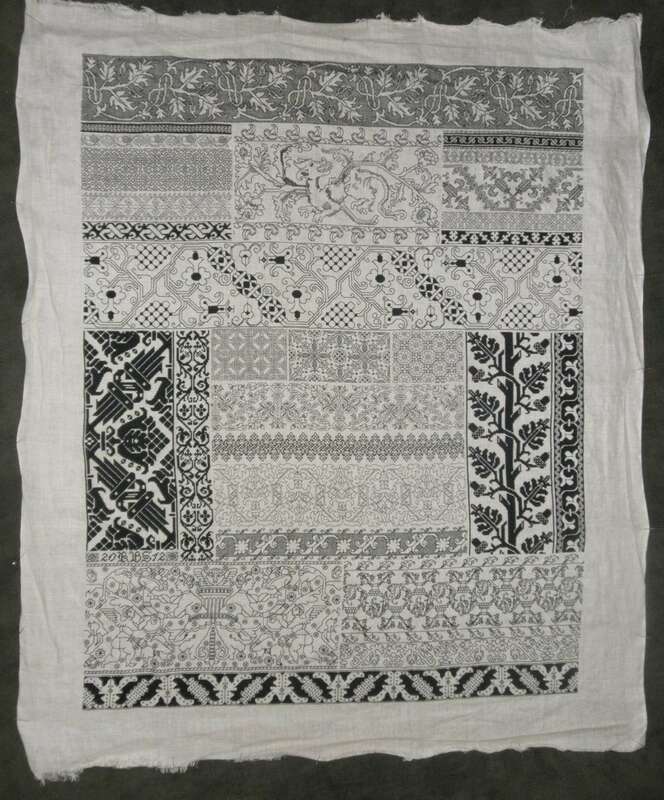 There’s a nice piece on historical use of cross stitches, including some members of the LACS family on Northern Needle. Most of them. 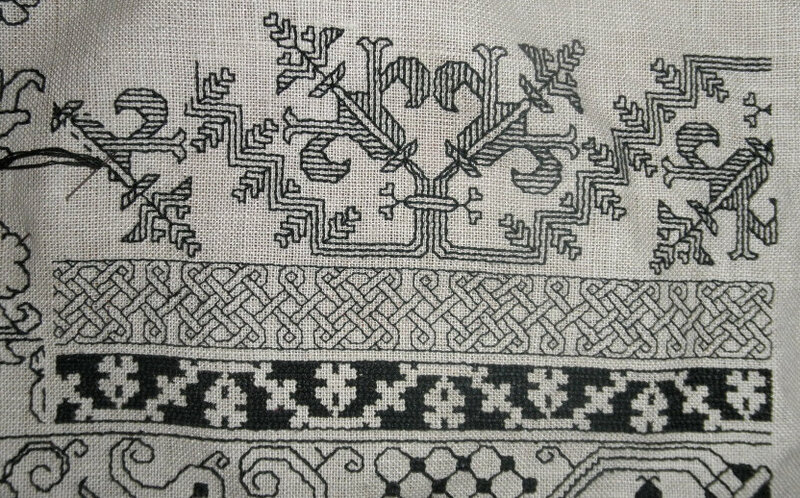 Exceptions are the three direct quotations from Lipperheide, and the three small all-over patterns that can be found in Ensamplario Atlantio . Also some of the patterns appearing on my last two large samplers – Clarke’s Law and Do Right – will also be in there. The exceptions being patterns that have already appeared in The New Carolingian Modelbook. 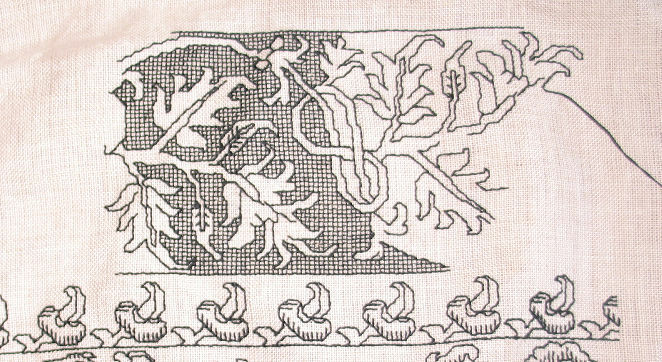 To start, there are sources for outline patterns from blackwork’s heyday. Around the same time as I got this question, Elmsley Rose reminded me that the on line edition of Trevalyn’s Commonplace Book is still available at the Folger. 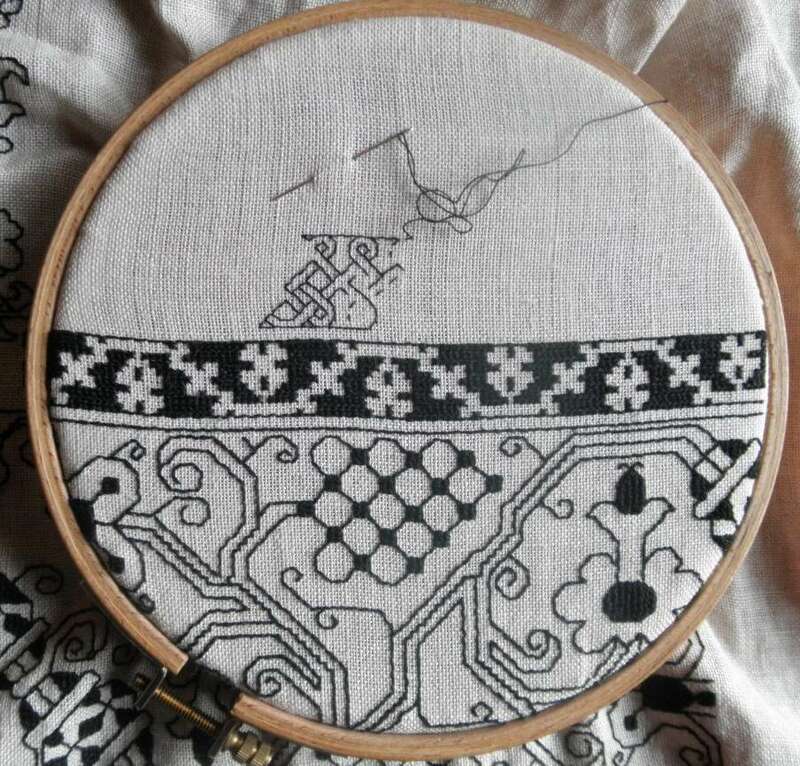 It’s a bit late for inhabited blackwork, but is not out of the question. It contains drawings in it that would be super for it (and even better for spot filled/stippled blackwork). This is the same resource that Kathy over at Unbroken Thread is using for her cap project. Of special note are the plates starting around the 7th page of the display (when 50 per page are shown). These peasecods would be killer; as would these plumes. Thanks from us all, Elmsley! If you’re not stuck on historical sources, all sorts of motifs and repeats are out there. I’ve done quite well using patterns intended for stained glass, and stencils as inspiration. I don’t have pix (these being from the pre-Internet era), but I did a couple of pieces from a Dover book of Japanese stencils that combined simple florals with the geometric fillings, to excellent effect. Patchwork patterns are also very useful as framing devices for contrasting fills. Also I’d nominate coloring books as outline sources. Yes, coloring books. Maybe not a SpongeBob book or Disney special, but there are quite a few that show flowers, butterflies, seashells, or geometrics. Late breaking update! I forgot to mention one source for historical and heraldic motifs, simply drawn. It’s the traceable art collection maintained by a consortium of SCA heralds. They use it to simplify the process of drawing up heraldry. 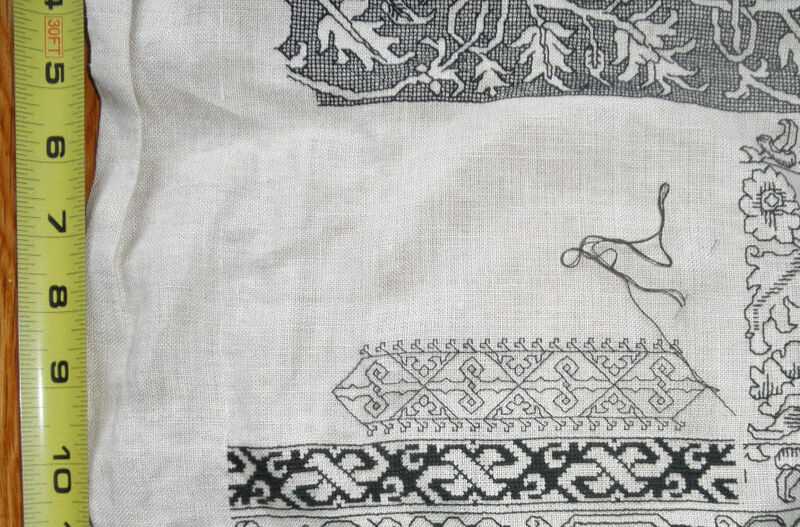 But there are all sorts of images in there that would make excellent small blackwork projects. Please contact the artists listed on the images before re-use. 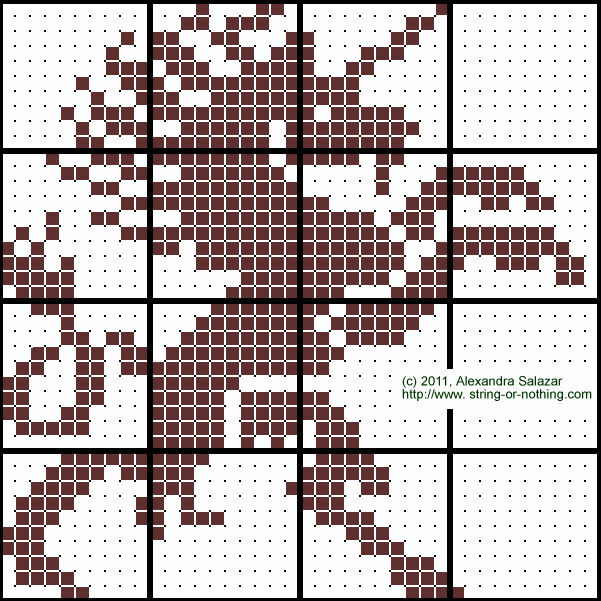 So there are lots of places to look into – you needn’t be forced to do a plain square grid. 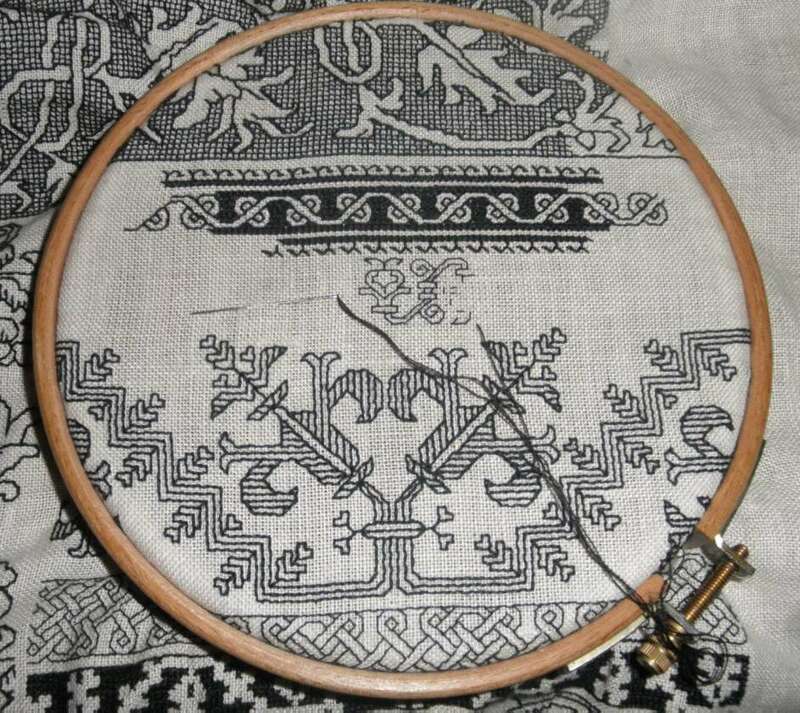 To date most of my pieces have been on 36-50 count linen, worked mostly over 2×2 threads. But that’s not the way historical pieces were worked. Their ground cloth weaves were in the 50-count and finer range, and they tended to stitch over anywhere from 3-5 threads. Three or four seems to be most common, and I can’t rule out up to 6×6 either. Also, as I graph up more and more from artifacts, I do note that not all historical ground cloths were spot on even weave. Most are off just a hair in one dimension or another, usually compressed along the vertical compared to the horizontal (selvedge to selvedge). Also – and again I work from photographs, so I can’t swear to the pinpoint count that up close and personal with actual pieces would bring – some of them do look as if they were stitched on skew counts. 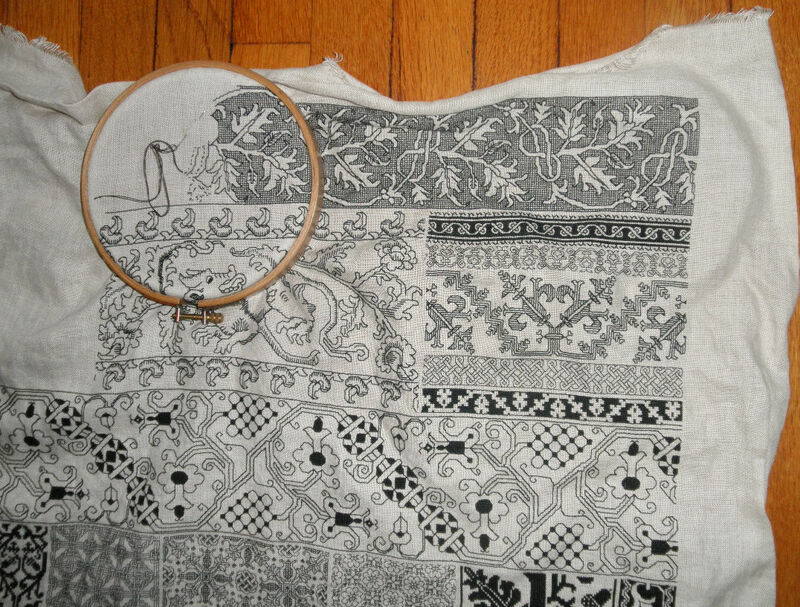 Taking one more thread on the vertical to make the output a bit more square in appearance. Or in our case today, drifted leaves. Covered by snow during our unseasonable pre-Halloween snowstorm. Very odd to have to shovel a path for trick-or-treaters. I’m still considering what to put left and right of the dragon, but have decided that whatever designs I end up using, both sides will be collections of narrow bands with short repeats, worked horizontally. But given the pace of the current strip, I probably won’t be getting to them until January. Not only due to current production speed, but also because of holiday interruptions and some end-of-year knitting obligations. I wish this was Smell-o-‘Net because the house is heavenly right now. Marian would have been proud of him, too! The dragon panel is finished! I wish the shading on the tail end of the beast better balanced that on the head end, but what I have here is true to the original. If I ever stitch him up again, I may modify the pattern somewhat and either lighten the branch on the right, or darken something on the left. Still I’ve been fond of this guy since I first saw him in the ’70s, and am delighted to have finally successfully charted and stitched him. He’ll be the last two charts in TNCM2 (he’s too big for one page). What’s next? A panel that will run the width of the piece at the top edge. This one will be another crib from Lipperheide, but unlike the last bits I borrowed from that source, it was too difficult to stitch it directly from the engraving. 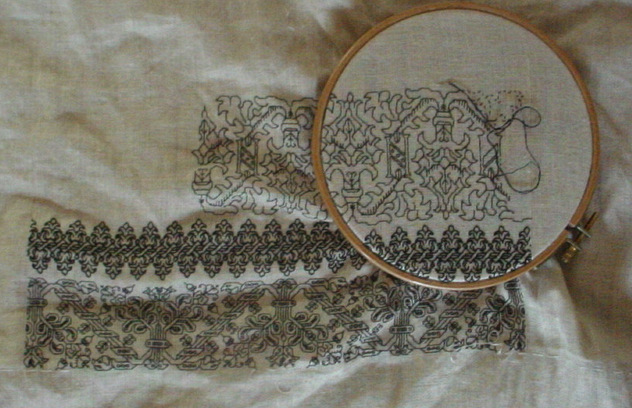 The background of that illustration is shown in the drawn squared filling (some museums label th stitch “punto milano”, possibly Italian 4-sided stitch, drawn very tight). 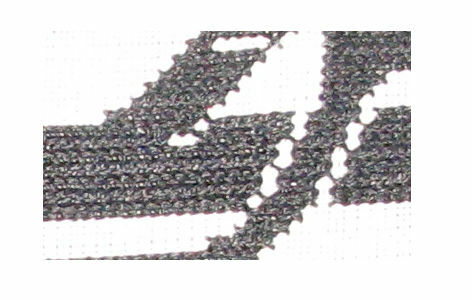 It sort of looks like a drawn thread ground, but it would have been VERY difficult to achieve all that thread removal given the scale and convolutions of the un-voided motif areas. In any case, I had to regraph it from the Lipperheide panel prior to work. Even though I drafted it up I do not think I will include this one in TNCM2 because it’s available in another contemporary source.